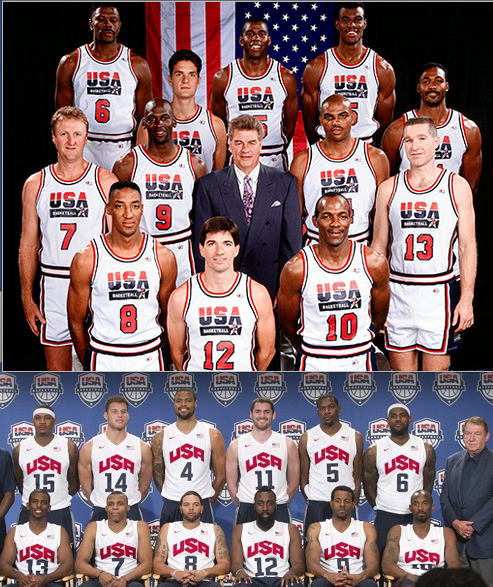 Dream Team Rosters: 1992 vs. 2012. Please see below for the 1992 team vs. the 2012 “Dream Team” rosters. No stats, no editorial, no bias, no commentary. Who has the superior team: LeBron, Durant & Kobe or Magic, Michael & Bird? Thank you, Wikipedia, for the copy/paste roster formatting. Kudos to Diane Pucin for excellent reporting on the decision by Fox to suspend Clippers Announcers Ralph Lawler and Michael Smith for Friday’s game vs. the Timberwolves. Now Ralph Lawler has not missed a game in 25 years. Dedicated, wonderfully enthused and talented, Lawler has been overlooked in a City of Wonderful Broadcasters from Vin Scully to Bob Miller to Chick Hearn, etc. The Clippers pitiful performance as a franchise certainly has everything to do with that, but his case for inclusion into the legendary pantheon has surely taken a hit with this back-and-forth with the equally enthused but far less seasoned Michael Smith. Were the comments overtly racist? My initial reaction was agnostic, figuring this was another corporate attempt at political correctness. After discussions with my wife, (whose parents are native to Huanusco, Mexico) who likened the exchange to “white people that thing all Hispanic/Latin Americans are ‘Mexican,” I agree with her to an extent – I think apologies (even of the profuse variety) are required from both Lawler & Smith as well as the organization, but I think the punishment was a bit harsh and will now tarnish the legacy of a solid announcer. And frankly, isn’t a lifetime of announcing Clippers games punishment enough?